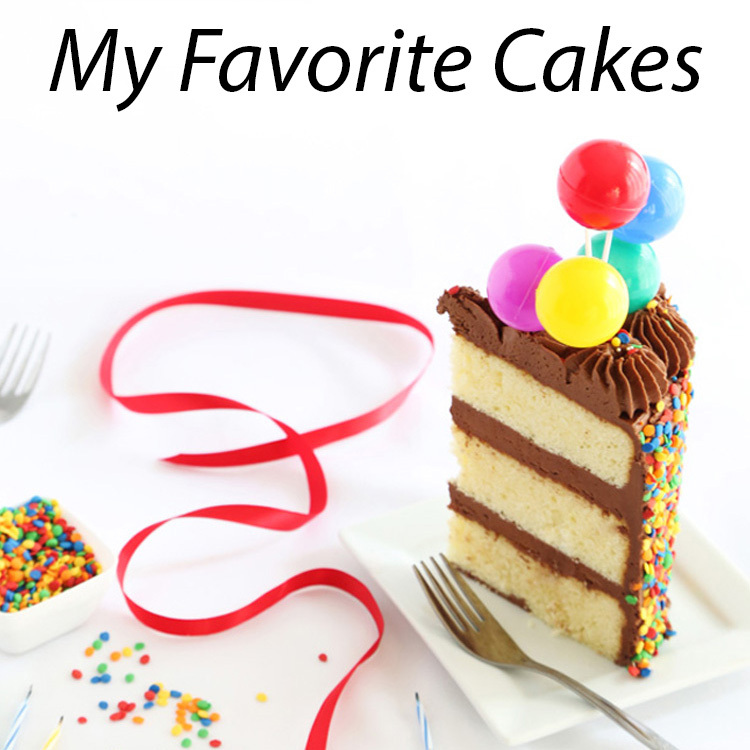 I'd like to introduce you to my favorite Devil's Food Cake recipe - or perhaps you've already met. You may recognize it from my cookbook (in a different kind of heart shape) or from this recent post on Food52. 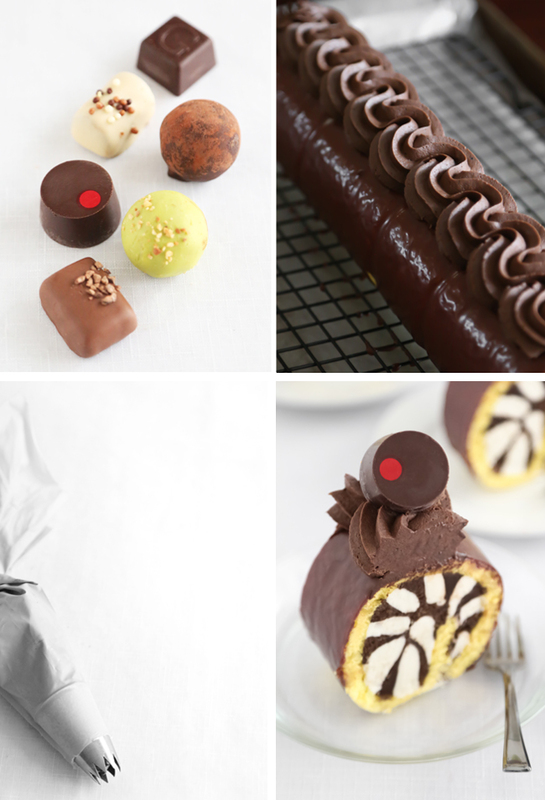 It's soft yet substantial and deeply chocolate with a velvety texture. 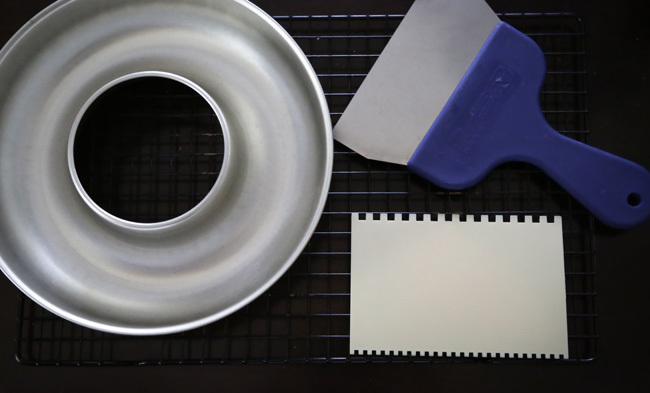 The recipe yields exactly one 9-inch round cake, but I also bake it in an 8x8-inch square brownie pan. I used the latter to make this cake. This cake revealed itself to me while I was sketching on my tablet. I've been recording some of my cake sketches, and I thought it might be fun for you to see one. More often than not, this is where my confections begin - on a drawing board. You can find a short video below (or here, for email subscribers). Believe it or not, after years of curating a specialty cake pan collection (an accidental one), I've never splurged on a heart-shaped cake pan. 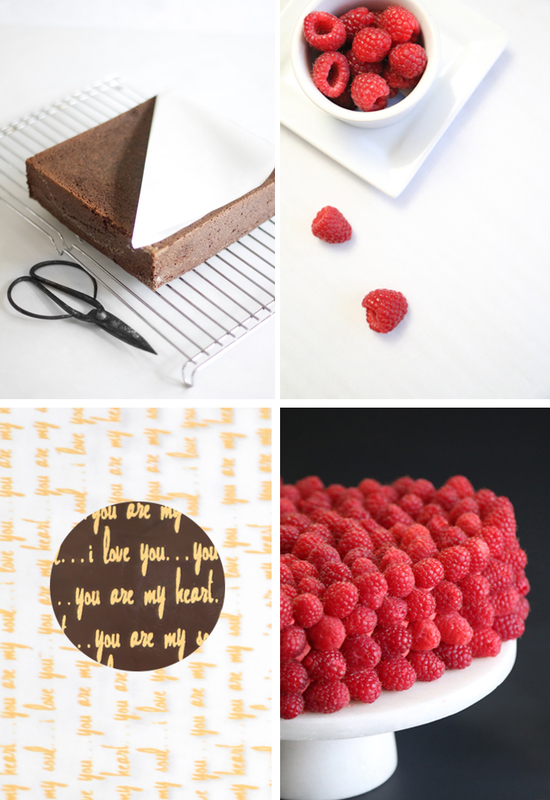 It's just so darn easy to cut your own heart-shaped cake from a template! 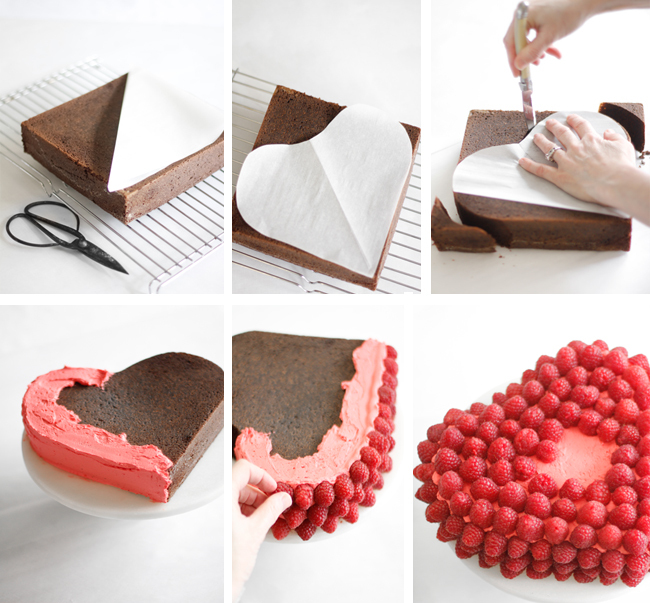 Just trace the bottom of the cake pan onto a piece of parchment paper, cut out the shape, fold the paper in half and then cut into a heart. 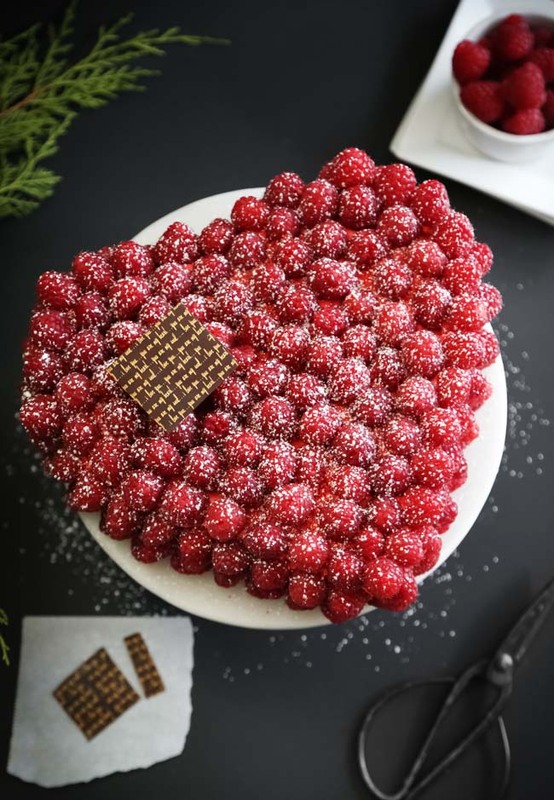 Trimming the cake into a heart is easy-peasy, just lay the template on top of the cake and cut around it with a serrated knife. The rest comes together rather quickly - just spread on a layer of frosting and go crazy with the berries. 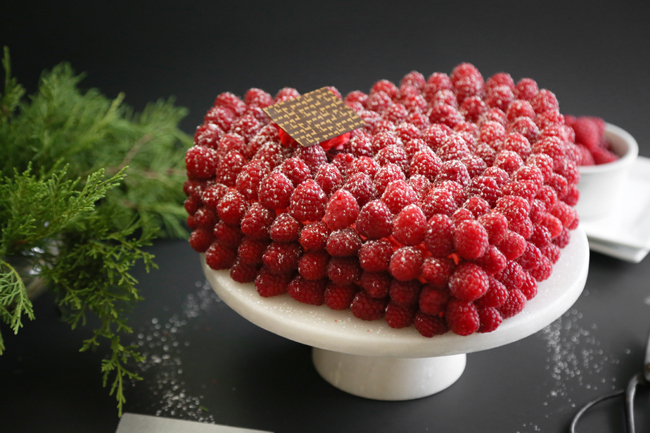 It's important to make sure you have enough berries to cover the entire cake, so don't leave the grocery store with less than 3 pints of fresh raspberries. Check out the inside of this cake. 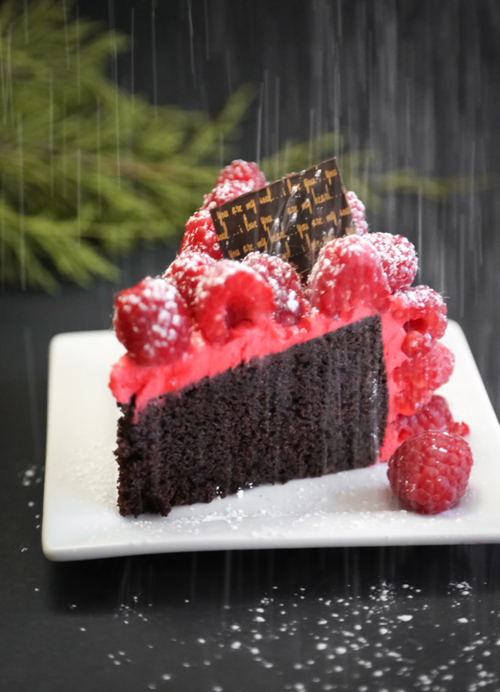 It's seriously dark and rich and so delicious with tart raspberries. Many months ago I purchased a sampler set of flavored salts on an impulse. The names and colors drew me in: Murray River Pink, Bolivia Sunset, and Red Alaea. Since then I've sampled all twelve salts in the set, and my favorite - the supply that is quickly dwindling - is the flavorful brown-black grains of Applewood Smoked Sea Salt. It lends a smoky, almost bacon-like richness to anything it touches. If you love the flavor of Applewood bacon, then you may want to pick up a pinch tin. It's good on just about anything! 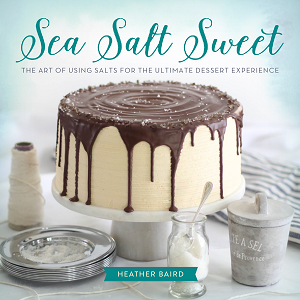 I've had the idea to use this salt on shortbread ever since I first tasted it. I just knew it would be fantastic on top of a slightly sweet, butter-rich cookie. And oh, it is! 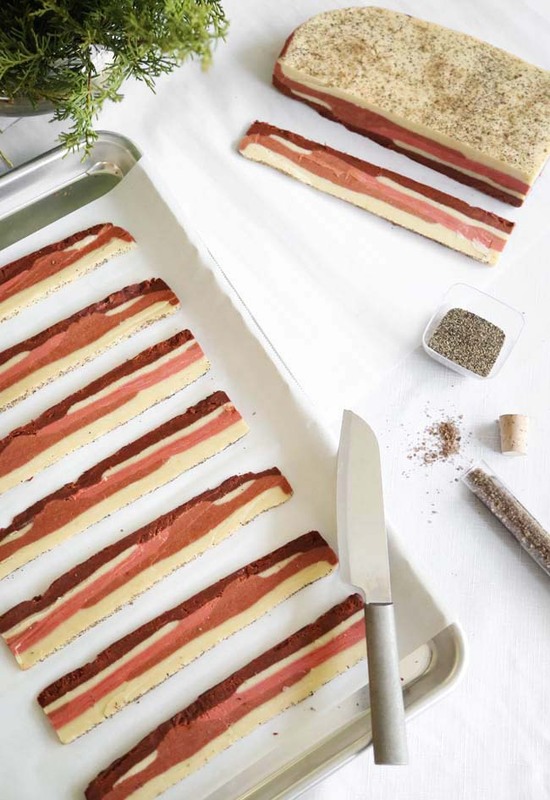 How fun are these streaky bacon slices? I learned how to make bacon cookies from Jennifer when she made bacon sugar cookies. I was happy to find the technique also works with shortbread dough. 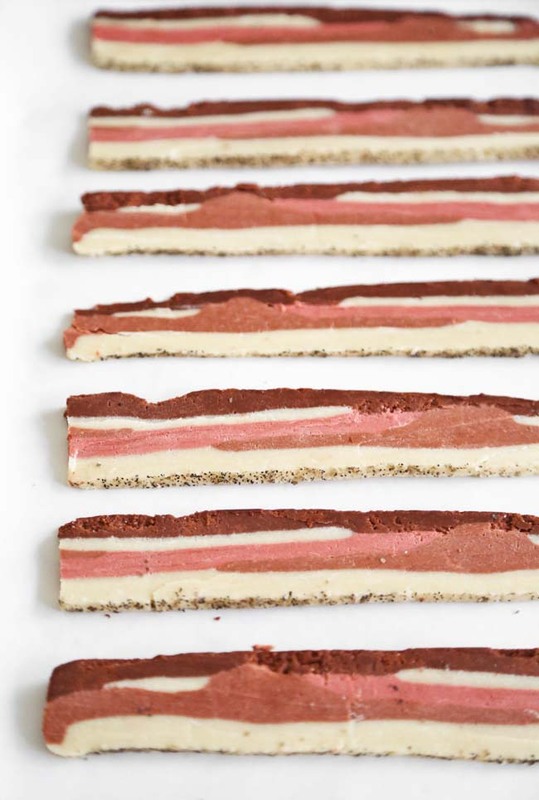 If you're into making your cookies look like bacon too, then be sure to take a look at her dough stacking technique. I followed it loosely, and was pleased to find my cross section of shortbread looking so... bacony! Once the slab of "meat" was assembled, I sprinkled on the Applewood salt and some freshly ground black pepper. 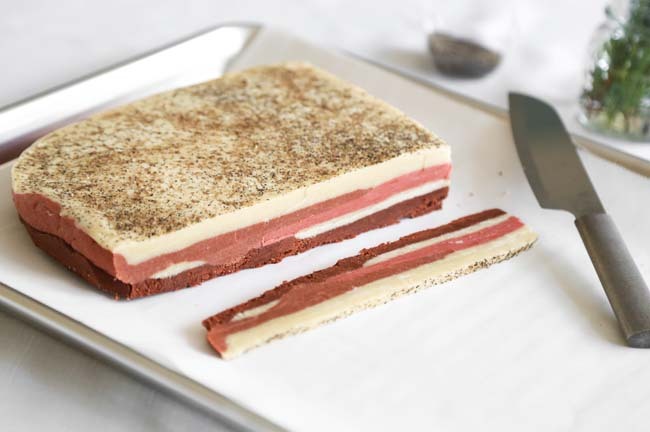 The sliced dough yields a well-balanced cookie, with the salt and pepper crust just at one edge. 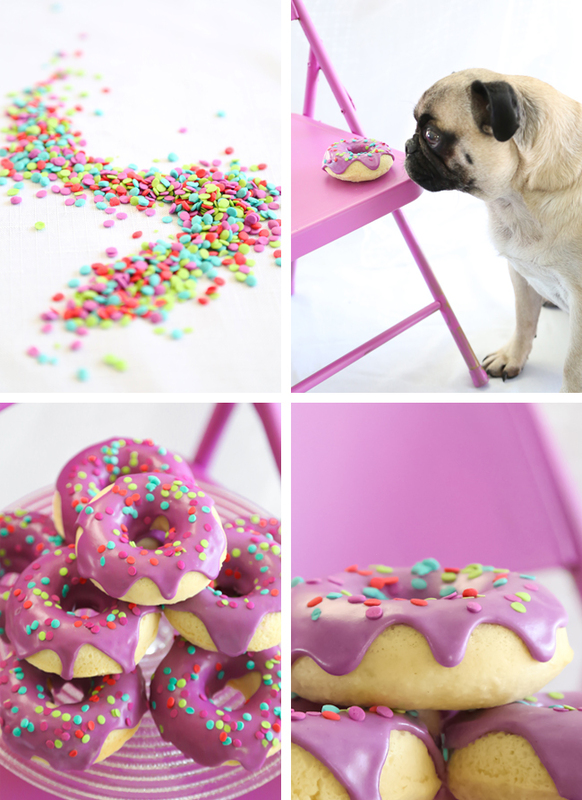 I love the playfulness of this treat, but it's really delicious too. 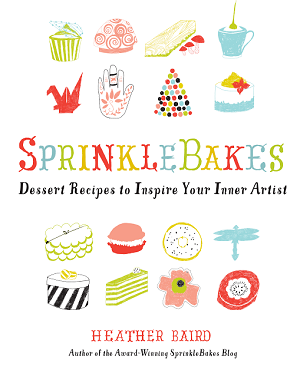 The recipe is based on the Scottish shortbread recipe in the Sprinkle Bakes book. 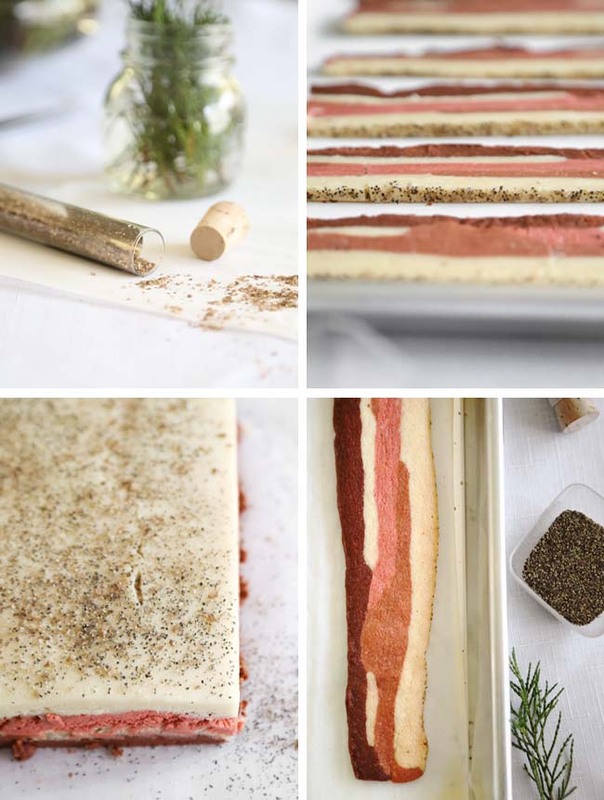 If you've been reading this blog for very long, then you know I love a cake roll. I found this recipe in a secondhand baking textbook, and was instantly smitten. The alternating chocolate ganache and vanilla buttercream interior was so striking on the page, I had to try my hand at the technique. 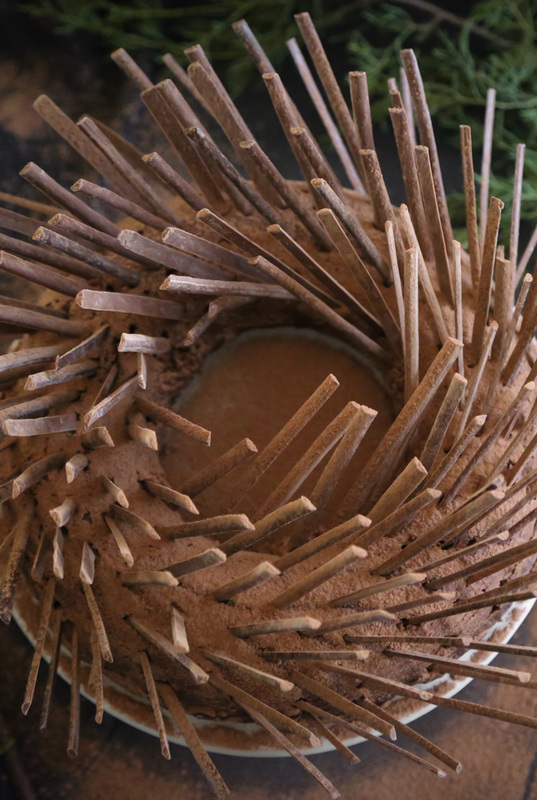 Compared to the eye-catching interior, the outside of the cake seemed a little plain. That was easily remedied with a swirl of dark chocolate ganache buttercream on top and an assortment of truffles. 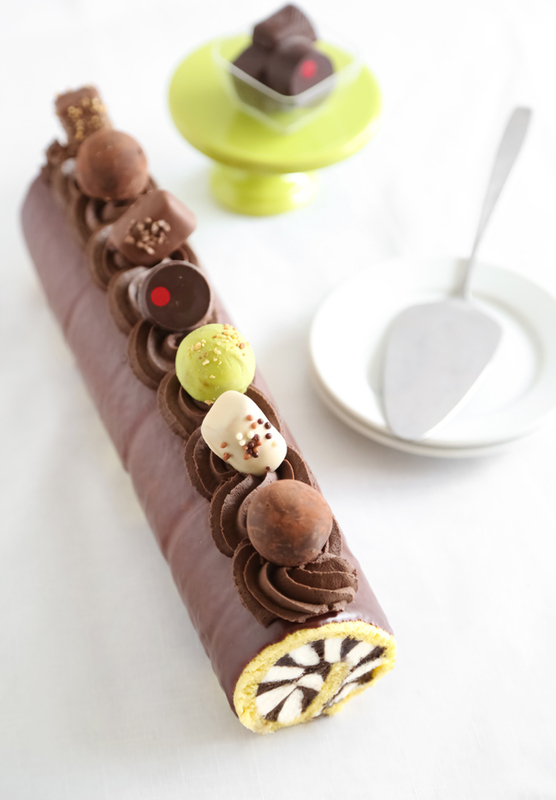 You may also recall how much I love bonbons on cake. January is a funny time, because just as you're getting a fresh start and looking at things anew, the world outside looks grey and dismal. Something about that doesn't exactly match up. Although there are days when I prefer a sky that looks like wet cement (accompanied by snowflakes, hot tea and fuzzy socks), there are other days when I long for a colorful landscape. 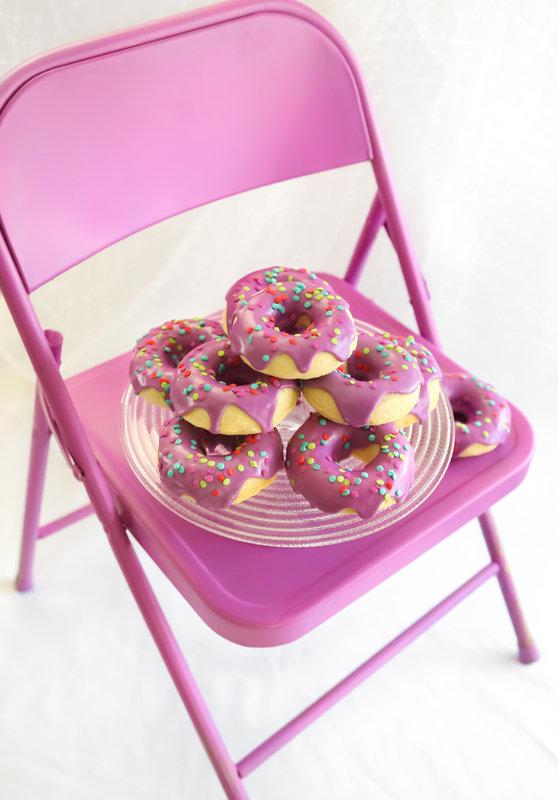 On those days I am prone to create my own scenery - like a mountain of purplish-pink doughnuts with the prettiest confetti sprinkles. Remember way back when I made these baby doughnuts? Since then I've used the heck out of that mini doughnut pan. Recently I decided that I needed the regular-sized version. I put it on my Christmas list and was happy to find it in my stocking. 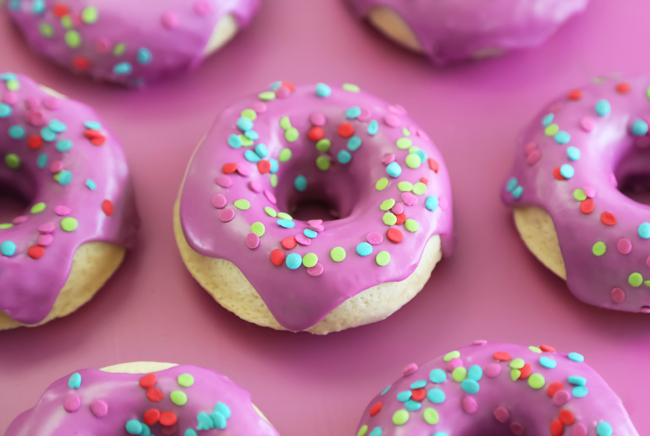 These buttermilk doughnuts could almost be called pound cake doughnuts. They're hearty and cakey and so good with cup of java. The tang of the buttermilk really makes all the difference, so I suggest seeking out the real thing. If you can't find real buttermilk, then a good approximation can be made with 1 cup of whole milk mixed with 4 1/2 teaspoons white vinegar or fresh lemon juice. January clockwork. This time of year always seems to bring out the optimist in me. I am hopeful. No other word can describe it better. Hopeful. 2014 was a year filled to the brim. 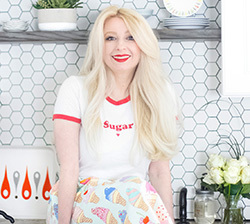 It was a year of baking and recipe testing and a whole lot of avoiding dirty dishes. It was the year I wrote a new book for you. I know it seems like forever ago when I first told you about it, and I'd considered keeping it a secret until closer to the release date, but ultimately I decided to spill the beans. 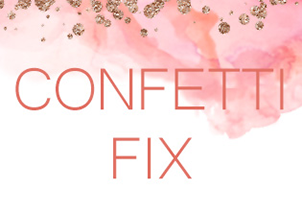 I want you to know what I'm up to, especially when blog posts seem sparse. I would love to be the kind of blogger who can simultaneously write a book of recipes and also post blog recipes regularly, but I am not that person. It's slow and steady for me, and I'm learning to accept my inner tortoise. Now the finish line is in sight with a fall publish date for the book and I could not be more excited. It was certainly a year of hard work, and for that, I'm grateful beyond words. I had trouble deciding what to make for the first blog post of the New Year, and I'd considered nearly a dozen recipes before settling on this one. My motto is, when in doubt - chocolate. Plus, genoise cake is something every baker and baking enthusiast should know how to make. If you're looking to expand your baking abilities in 2015, then this classic cake is a great place to start. Genoise is a sponge cake that has no chemical leaven, and instead relies on the air whipped into eggs to give it rise as it bakes. 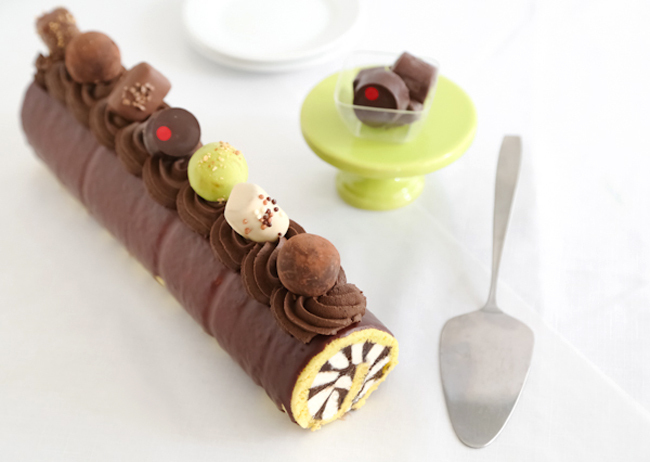 The cake's dry spongy texture is made for soaking up delicious flavored syrups and it's sturdy enough for layering, so it's no surprise that this recipe is a common building block in patisserie. This cake is often baked in a thin sheet or in a standard 9-inch round, but I decided to use a Savarin Mold. I love how this pan makes cakes look like one big doughnut (note to self: make One Big Doughnut Cake). 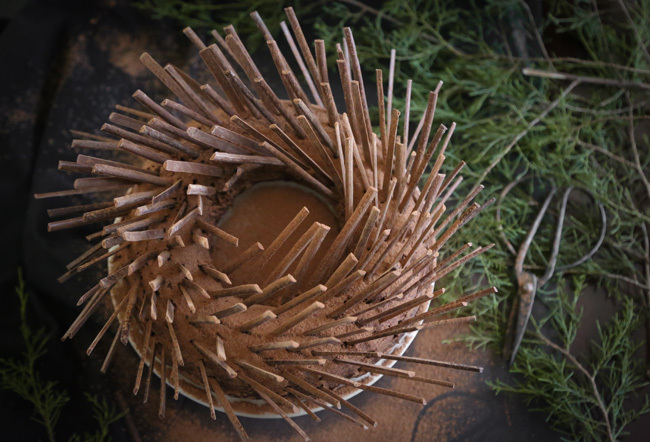 What do you think of this cake with quills? I'd seen a similar cake in a bakery, and decided to make my own version at home. It reminds me a little of the winter treescapes right now - a whole lot of bare limbs jutting towards the sky. 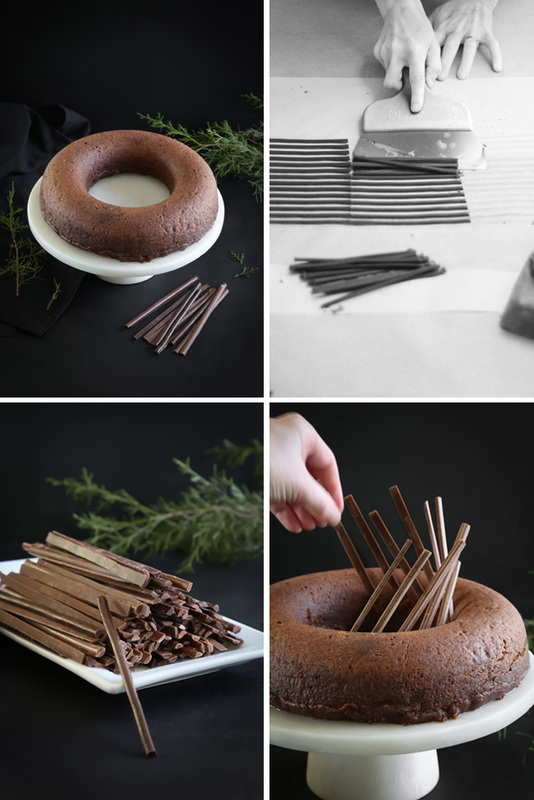 Chocolate sticks can be purchased online, but because this cake requires quite a lot of them, I made my own. It's not difficult, and if you have the tools, it's totally beginner friendly. 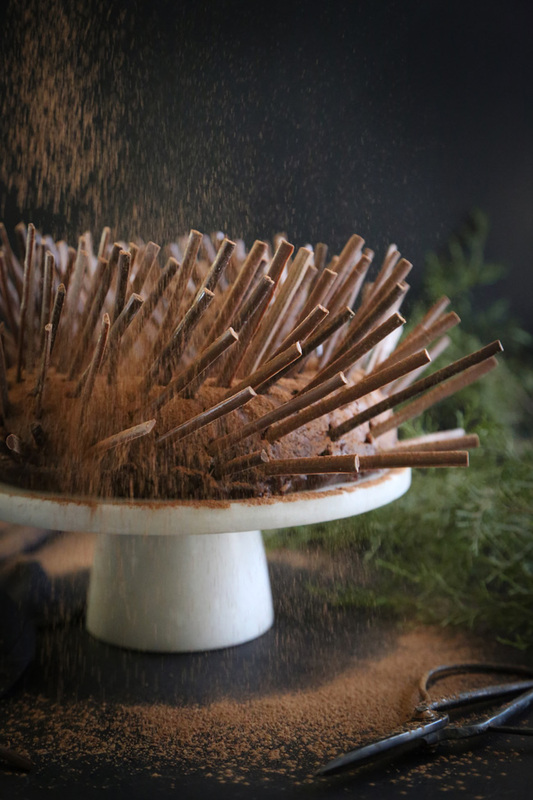 Another great thing to learn in 2015 (if you haven't already) is how to temper chocolate. You can find my tutorial here with last year's Etsy post for Red Velvet Bonbons. But if you're not inclined to temper, then an excellent substitute is Ghirardelli Chocolate Melting Wafers. These wafers taste deeply chocolaty and no tempering required.